I am thrilled to announce new research on the Enneagram and ego development, just published in the Journal of Adult Development following a blind peer review process. So you might ask – this is news? For those of us who work with this powerful system, it’s a given. But in order to help the Enneagram be more accepted in the world of mainstream psychology, we need data. As far as we know, this is the first study to examine the efficacy of the Enneagram to promote growth. It’s a step in the right direction – and we need more. The impetus for this project began in 2004 at an Enneagram Intensive training in Asheville, NC, when a student spoke to David and me and essentially said, “I’m watching people change right in front of my eyes. This work helps people move up levels of ego development. We need a study.” So off we went with David’s enthusiasm and can-do attitude, our student’s knowledge of a model we could use, and my steadfast commitment to and passion for the Enneagram. We had no idea what we were getting into in terms of what is required to produce a research paper for a scientific, peer-reviewed journal. Over the years, we found excellent resources, notably the other authors of the manuscript, each of whom added significantly to the end result. We encountered dead-ends, challenges and delays. Even in the final push, I said to Seth, our statistician, “Please just tell me if we have anything worth publishing. If not, I’m ready to call it quits!” With much experience in the world of publishing, he kindly said to me that what I was feeling is typical of all who attempt this kind of work. He advised me to hang in and be patient. I couldn’t be happier that we all persevered. My only regret is that David is not here to be part of this celebration. The paper was submitted to the Journal a few weeks before he died in May 2017, so I’m grateful that he knew we had gotten to that point. This paper is available for free online. The link is below. Please feel free to share it widely and extensively. It’s another way we can fulfill David’s mission of bringing the Enneagram to the world. And maybe this article helped that world become a little bit larger! 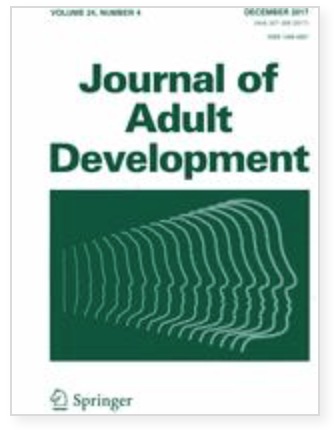 Note: The Journal of Adult Development is an interdisciplinary journal covering development in early adulthood, midlife, and later adulthood. The Journal supports innovative theoretical and empirical articles that help direct the future of our field. Critical issues include the importance of life-long education, work and family changes, and physical and mental health influencing adult development. In addition, the impact of personality, emotions, cognition, and biomarkers are areas of interest. The Journal emphasizes the importance of inter-individual differences and contextual issues influencing adult development. Interventions that promote optimal development throughout the adult life span are also welcome. The Journal of Adult Development is published in collaboration with the Society for Research in Adult Development. Congtratulations! This is indeed exciting news! What a special way to honor David plus give a forum to many voices. Thank you Enneagram in the Narrative Tradition folks. Again you lead the way. This is awesome news. I hope to do the EPTP training in August and wonder if similar research is being undertaken with the Enneagram Prison Project. I am hoping to get it into our UK prison system next year. Congratulations! I know what all goes into getting an academic article published, and I salute you all for your persistence. I sincerely believe that using the Enneagram in our personal lives absolutely supports and nurtures development. Wonderful news, such a huge step forward! Congratulations! Hopefully ‘further research’ will flow from this determined start. This is long overdo, but it is wonderful! I am so sad David is not here to be part of the celebration. This is landmark research. I am hoping this will encourage students everywhere to add and build a bibliography that legitimizes what many of us know by body, mind, and heart. I am delighted to offer Terry and everyone associated with this research, my congratulations and deep appreciation for producing this body of work. It is an important step in bringing efficacy and veracity to the work we do, and helps to dismiss the whiff of cultism that the Enneagram is sometimes accused of. Thank you. Wonderful news! And wonderful conclusion to a lot of work, and it sounds like some angst. Congratulations to you, Terry, and all of the team. Thank you Terry for hanging in there to get this work published. I hope that it will be an inspiration and model for more rigorous research to appear. Congratulations! Congratulations to all the researchers and writers who made this giant step in “legitimatizing” the powerful effect of Enneagram studies and the changes that occur in adult development as we incorporate the work into our own lives. What a gift the Enneagram has been in my own life. Thank you to Helen, David, and many “pioneers” of our association who have worked so hard to get the Enneagram to this point of acceptance by the professional community.